The bottle is in the common shape of that used for Pinot Noir. But what’s inside the bottle is anything but common. Spatburgunder is what is known as Pinot Noir in Germany, that country so well known for its white wines, particularly Riesling. It’s too cold in Germany to grow red wine grapes, or so a common mis-assumption goes which may explain why non-German people don’t shop for it. O.K., that’s a generalization. But it’s pretty much a fact too. Here’s another: Germans reportedly enjoy the highest per-capita consumption of Sparkling Wine. And Germany is the world’s third largest producer of Sparkling Wine after France and Italy. So yes, that means Germany produces more Sparkling Wine (where it is known as Sekt) than even Spain produces its famous Cava and Germany is three places ahead of the U.S. in Sparkling Wine production. But then, grapes used in Germany for premium Sparkling Wine are mostly Riesling, Pinot Blanc (Weissburgunder), Pinot Gris (Grauburgunder) and (surprise) Pinot Noir! And these grapes do well in carefully selected sites with attention to exposure and taking full advantage of any element of moderation. Baden (in SW Germany near the border with France) is an area well known for producing Spatburgunder. 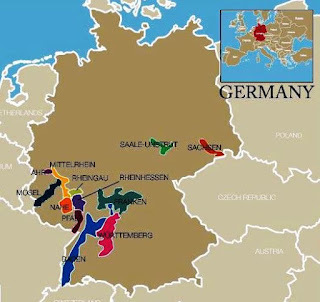 It is the largest of Germany’s 13 wine growing areas (though only a small amount is dedicated to viniculture) and is comprised of two unconnected segments along the east side of the Rhine and three small subareas along Lake Constance. It follows Rheinhessen and Pfalz in vineyard acreage. Moderation of temperatures is provided by the river, lakes and steep slopes that take full advantage of the sun’s warming influence. Ahr, on the other hand (and the source of this bottle), is one of the most northern regions and among the smallest with just over 1,300 acres planted. In the past, Pinot Noir from this area was often somewhat sweet and made from late-picked grapes. That changed in Germany’s red wine renaissance of 1995-2000. Today, expect fully fermented, dry, oak-aged wins of good complexity and reflecting a sense of place. Growers in Ahr take full advantage of the areas’ micro-climates. Slopes on either side of the Ahr river can reach 980 feet with the best slopes facing south-east on soil of slate, basalt and greywacke clay. Sunlight is captured by these steep slopes, reflected by the river and warmth retained by the black soil. At between 50-51 degrees latitude, viniculture here requires such attention to detail and (to my palate) produces wine sharing the affinity of the varietal but with a unique personality. Opened and poured, the wine’s nose was dusty plum and black fruit with some “funk”. Taste was soft, mostly black cherry with gentled notes of black pepper. Light ruby in the glass, indicative of cool climate. Light tannins – no surprise – it’s Pinot Noir. In a way, it reminded me of a cru-Beaujolais but I’m always looking for comparisons so that could just be me. Allowing the wine more air opened its fruit. Still black cherry but now lightened with tart cranberry. Floral notes – lavender – mixed with spice. I played between tasting and sniffing, red fruit beginning to develop on the palate. The wine was elegant. Finessed. A fine marriage of fruit to savory in a medium finish wine. If you, like so many of us, look past Germany when considering a Pinot Noir, perhaps it’s time to change your mind. Follow and “like” Wine Mizer on Facebook for mini-reviews, suggested food pairings, industry news and more. The temperate zones at 20-50 degrees latitude, north or south of the equator, are considered suitable for viniculture. Ahr, at 50-51 degrees is a challenging region and one that imparts what I appreciate as a unique character in the hands of a talented winemaker. Werner Nakel was chosen winemaker of the year (2004) in the Gaulty-Millau. In 2008, “Decanter Magazine” awarded him the International Trophy for Pinot Noir and stated, “It’s a fantastic achievement for Germany to win this trophy. Imagine it – they have beaten Burgundy, New Zealand and Oregon, all acknowledged Pinot regions of the world.” In 2011, “Fallstaff” (Austria’s leading wine publication) chose him for their highest award. ARP: NOTE: Be advised this makes no sense. 2014 $22, 2015 $30, 2016 $14. And I saw a quote from a reputable dealer at $56.50 for the 2014, none of which include S&H. I bought it locally at Binny’s for $32.99. that I made along with a German potato salad. But you can pair this Pinot as you would normally.